PDC is happy to report that we are featured in the latest PMEngineer magazine for our work at the new Johnston County Airport – and we’re on the Cover! Special thanks go to friend and product rep Len Bowden of Smith and Stevenson and public relations guru Suzanne Freckmann for their work and coordination with Bradley, manufacturer of the beautiful lavatory featured in the cover photo. We are also eternally grateful to the architect, Boomerang Design, for continuing to include us as a member of their team, and to Ray Blackmon from JNX for his leadership and for participating in this process. PDC Engineers takes pride in being a part of projects that give back to the community in which we work and live. We would like to thank Dan Huffman Architecture for the continued partnership and congratulate them on another project with no shortage of exemplary design and obvious integrity. PDC is pleased to add two new projects to our growing list of LEED Certified work. 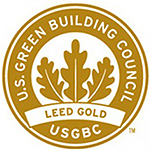 The Greene County Intermediate School in Snow Hill, NC and the Klaussner Building at Randolph Community College in Asheboro, NC have both recently been awarded LEED Certification at the Gold Level. Congratulations to all of our partners on these projects, and thank you to the people in the communities served by these organizations for supporting their efforts to make our world a bit more sustainable.